Tompkins was in certain ways a successful man and in other ways a rather complicated, tragic figure. Although he served in high political offices - both as Governor of New York, as well as Vice President of the United States for both of James Monroe's terms as President - he was hampered by a debilitating fight with alcoholism, which brought him both ill health and financial problems. While addressing his many successes, the U.S. Senate's biography on Tompkins speaks directly of alcoholism's effect on Tompkins's potential, quoting a contemporary of Tompkins who said, "There was a time when no man in the state dared compete with him for any office in the gift of the people and his habits of intemperance alone prevented him from becoming President of the United States." While it may seem a bit odd to focus on this aspect of Tompkins biography, I think it's a worthwhile reminder that Tompkins was human - a Governor, a Vice President, and the first leader of the Scottish Rite's Northern Masonic Jurisdiction - but a human nonetheless. And Tompkins is certainly not forgotten - he is the namesake of both New York City's Tompkins Square Park, as well as Tompkins County, NY. Tompkins grave is in New York City, at St. Mark's Church-in-the-Bowery, where there is also a statue of him. In Scottish Rite Freemasonry today, Tompkins is, understandably, overshadowed by John James Joseph Gourgas, the Secretary General who served alongside him during the early years of the Northern Masonic Jurisdiction's Supreme Council, and who would himself serve as Sovereign Grand Commander from 1832-1851, guiding Scottish Rite Freemasonry through the difficult years brought on by the Morgan Affair. By most accounts, the first two Sovereign Grand Commanders (the 2nd Sovereign Grand Commander was Sampson Simson, who served from 1825-1832) did little to help the Northern Masonic Jurisdiction flourish, and that it was Gourgas who did much of the work during their tenures. If you're interested in learning more about the history of the Scottish Rite's Northern Masonic Jurisdiction, we can recommend the two histories listed below. The story of the Scottish Rite's Northern Masonic Jurisdiction is that of a journey that begins in France and ends in Lexington, MA, with stops in the West Indies; Charleston, SC; New York City; and Boston in between. And here's some info on the current Sovereign Grand Commander. Newbury, George Adelbert & Louis Lenway Williams. A History of the Supreme Council, 33° of the Ancient Accepted Scottish Rite of Freemasonry for the Northern Masonic Jurisdiction of the United States of America. Lexington, MA : Supreme Council, A.A.S.R., N.M.J., 1987. 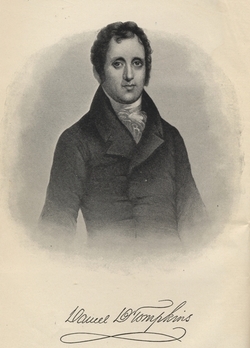 The illustration of Tompkins seen above is from the frontispiece of the first volume of Public Papers of Daniel D. Tompkins, Governor of New York, 1807-1817. New York; Albany: Wynkoop, Hallenbeck, Crawford Co., 1898.